Officially, the fastest a Lexus LFA Nürburgring Edition has ever lapped the Nürburgring Nordschleife is in 7:22.85. That’s an amazing performance, and it makes the car faster than a Porsche 911 GT2 RS (on stock tires) or a Pagani Zonda F Clubsport. That time is over fifteen seconds faster than a standard LFA, proving that the Nürburgring Edition’s improved aerodynamics, modest power gain and faster shifting can translate to real-world benefits with the right driver on the right track. 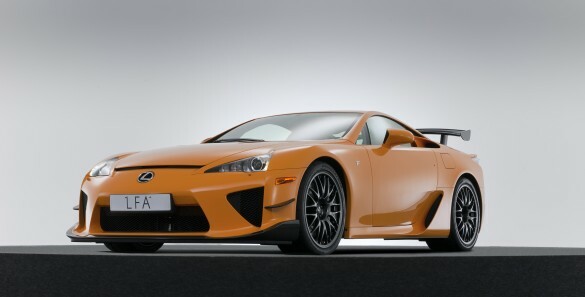 According to EVO’s Chris Harris, there’s about to be a new record announced for the Lexus LFA around the ‘Ring. It seems that Lexus driver Akira Iida, who’d set the previous lap record, just knocked off a time of 7:14 from bridge to gantry, besting his old time by a mind-warping 8.85 seconds. On a track where drivers struggle to shave tenths of a second off their lap times, finding nearly nine seconds is a truly remarkable feat. If Iida’s lap time is validated, it would make the Lexus LFA Nürburgring Edition the fourth-fastest production vehicle to ever lap the ‘Ring. In fact, if you discount the Radical SR8 laps (because to be honest, they’re street legal race cars), only the Gumpert Apollo Speed is faster. It would also make Lexus the fastest major manufacturer around the ‘Ring, since 7:14 even beats a Porsche 911 GT2 RS on Michelin Pilot Sport Cup tires. We’ll keep you posted as more details on Iida’s record lap come out.